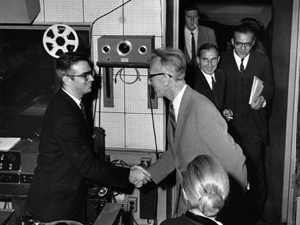 Dmitri Kabalevsky (right) thanks Henry Friend, supervisor of Juilliard’s acoustics department, at the close of a Composers Forum attended by a delegation of Soviet composers in 1959. In doorway, from front to back: George Safirov of the Soviet Embassy, Vladimir Ussachevsky of Columbia University, and alumnus Hall Overton. November 17, a group of Soviet composers—Fikret Amirov, Konstantin Dankevich, Dmitri Kabalevsky, Tikhon Khrennikov, and Dmitri Shostakovich—and musicologist Boris Yarustovsky spent a day at Juilliard as part of an official visit to the United States through a Soviet-American cultural exchange agreement, which had enabled American composers Roy Harris, Ulysses Kay, Peter Mennin, and Roger Sessions to spend a month in the Soviet Union the previous year. The delegation attended a Composers Forum of recorded and live performances by Juilliard faculty and alumni, an orchestra rehearsal with guest conductor Samuel Krachmalnick, an opera rehearsal, and a luncheon in their honor. November 4 and 11, the English tenor Peter Pears gave two public master classes at Juilliard devoted to vocal literature. The first session focused on the interpretation of songs by Handel and Benjamin Britten, Pears’s longtime collaborator and life partner. The second class dealt with Lieder of Schubert and Schumann including excerpts from Die schöne Mullerin, Die Winterreise, and Dichterliebe. November 8, former faculty member Julius Baker presented a flute recital with guest artists Joseph W. Polisi, Erich Graf, Trudy Kane, Jeffrey Khaner, Janet Millard de Rold, and Lisa Emenheiser Logan. Works by Mozart, Dutilleux, Jolivet, Telemann, Kuhlau, Gaubert, Borne, and Boismortier were performed. November 17, the Juilliard Dance Ensemble presented a concert at Forest Hills Performance Space dedicated to the memory of Leonard Bernstein and honoring Juilliard dance faculty member Anna Sokolow. The ensemble performed a solo and three duets choreographed by Sokolow (Kaddish, Lyric Suite, Odes, and “The Lovers” from Magritte, Magritte), Marjorie Mussman’s Octet, Paul Estabrook’s Untitled IV, Daniel Pelzig’s Kleine Kammermusik, and Le Jardin à Villandry by Martha Clarke, Robert Barnett, and Felix Blaska.